An all-spades flop - K-Q-x - gets the attention of participants Dan O'Brien, Lee Markholt and a third challenger. 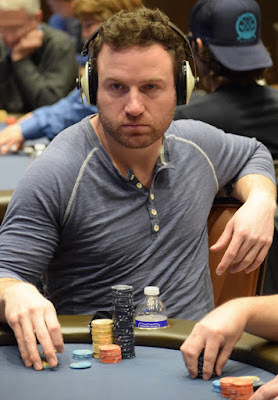 O'Brien leads out for 2,400 and a short-stacked Markholt takes a bit of time before committing his final chips. The third challenger steps away and O'Brien calls. O'Brien Tables King_Jack with the Jack of Clubs. Markholt shows Ace_Ten, Ace of Clubs. O'Brien with a made hand, Markholt with a better flush draw and a backdoor Broadway draw as well. Queen turn, 3 river and one semi-regular from Jimmy Horikawa's games eliminates another semi-reg from the same weekend game in Reno.